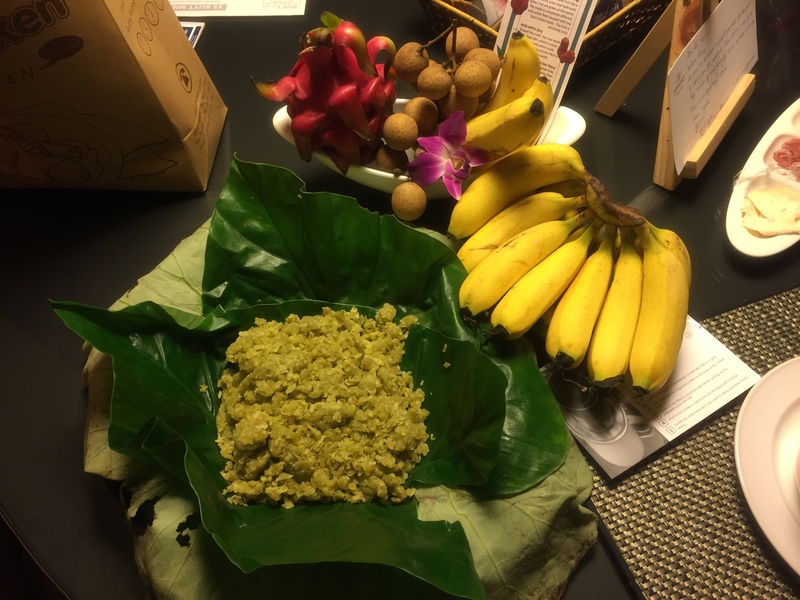 Autumn Moon wrapped young rice with bananas, fresh longan and red dragonfruit, all from Thủy, made our first morning breakfast easy. 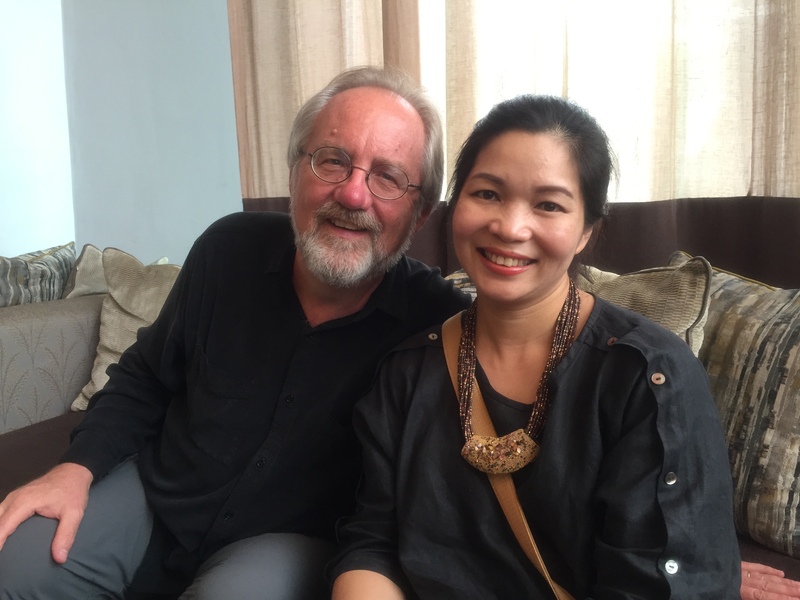 Jan and I have returned to guide the next steps for the Hà Nội New Music Ensemble for the next few months. There is much work to do behind the scenes before getting on stage in late October and early November. When we began Southwest Chamber Music thirty years ago, we were told that if you survive the first three years we’d make it. By the nature of their infancy, new endeavors always face uncertainties. Because of our experience we carved out a big chunk of time in our schedule to assist our friends as they address their crucial second season. The Vietnamese, however, are the international experts on survival. Jan and I have complete faith that we will find a rewarding finish line together in the years ahead! 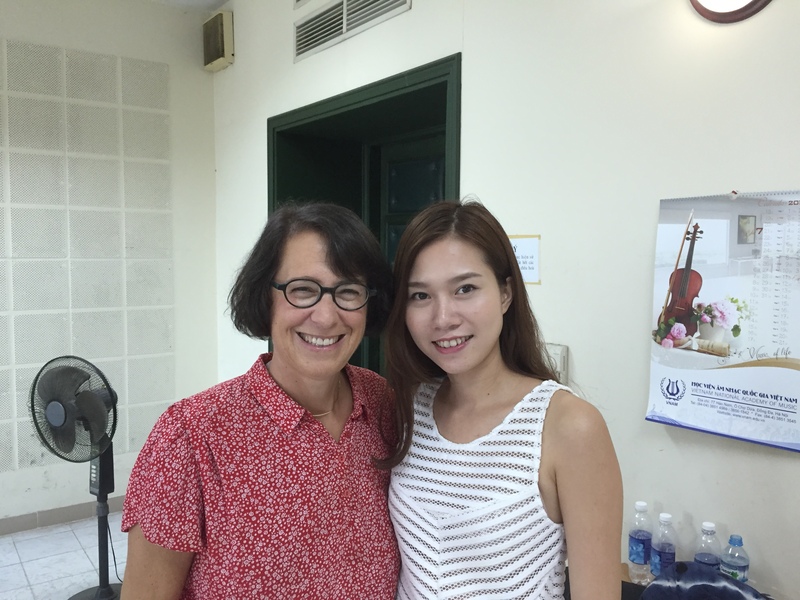 A happy first rehearsal reunion for Jan with the energetic young violinist Vũ Khánh Linh. If truth be known, musicians know the best places to eat. All the endless hours spent in the abstract time world of sound makes nourishment acute. And so though I left my heart in Hà Nội, I think I’ve also left my stomach! Throughout this autumn I’ll be posting regularly about some of the superpower street food and restaurant places my Hà Nội New Music Ensemble members recommend. 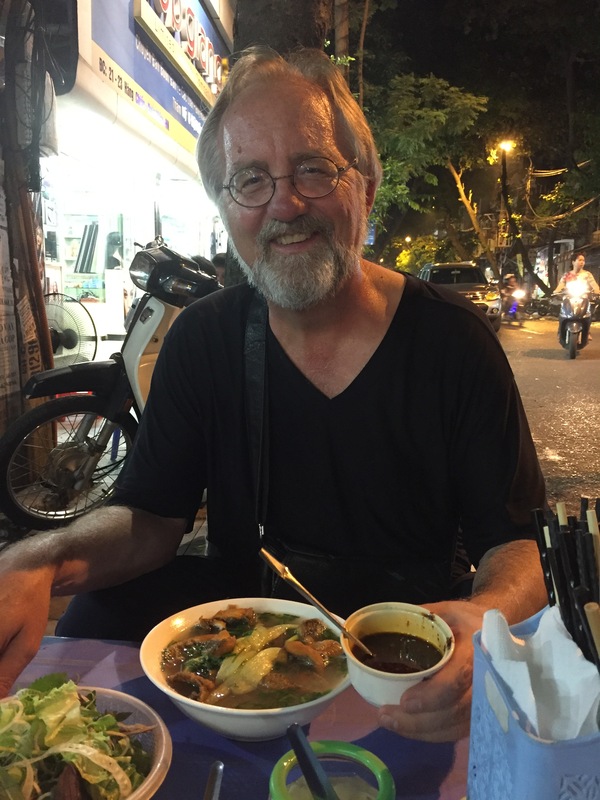 Jan and I are happy to write another chapter in our experience with the cuisine of Việt Nam and hope you enjoy the posts. The greatest coffee in the world is at Cộng Cà Phê. This Old Quarter branch recently hosted François Hollande, the President of France. First things first. Vietnamese coffee is one of the culinary wonders of the world. Dripped beans that make any espresso seem weak blend with condensed milk, allowing the significant issues of jet lag to recede with ease. 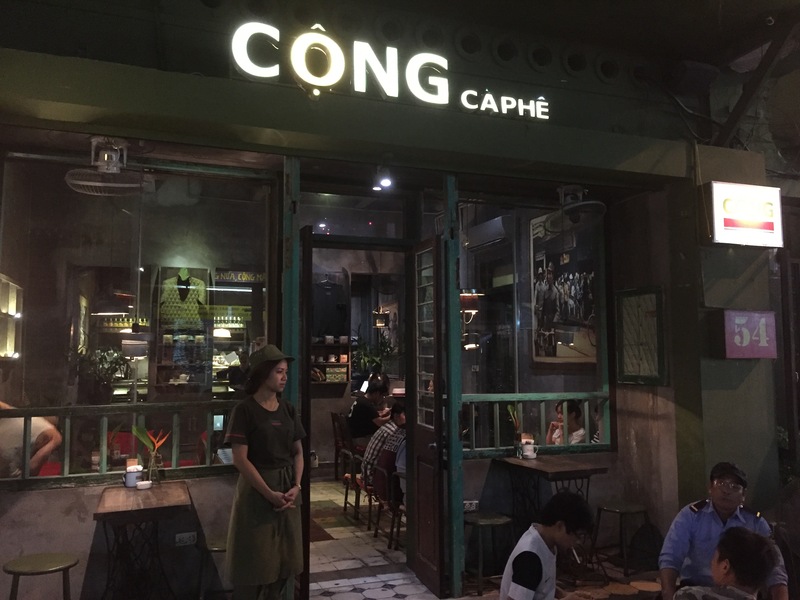 If you don’t drink coffee and come to Hà Nội, change your mind and have one at Cộng Cà Phê. It’s good enough for the President of France, if you need a recommendation. Good morning, Vietnam! With composer Vũ Nhật Tân and our Hà Nội New Music Ensemble manager Bông Hoa at Cộng Cà Phê. Upon arrival, Jan and I were met at the airport by our Vietnamese tutor, Trần Thu Thủy. 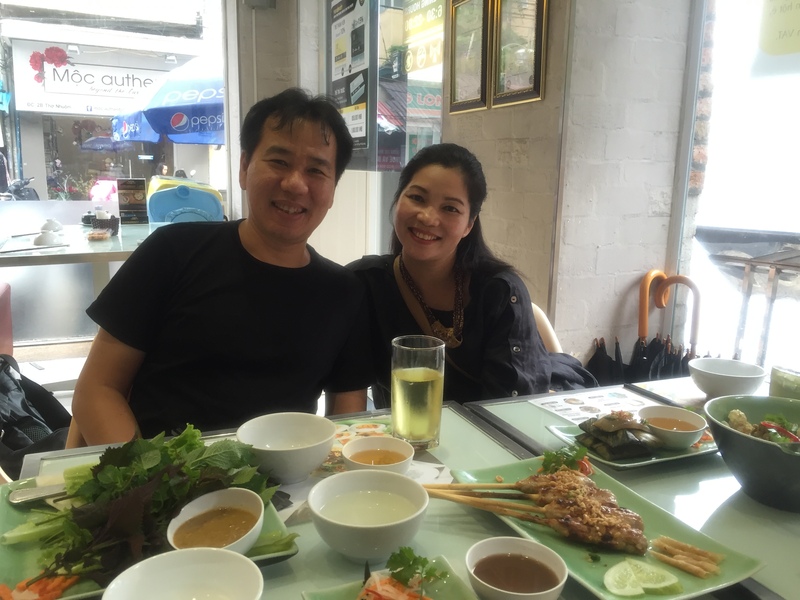 When her husband, violinist Pham Trường Sơn, joined us for a very jet lagged lunch (we arrived at 9 AM) they decided to take us for a short walk from our hotel to Món Huế. 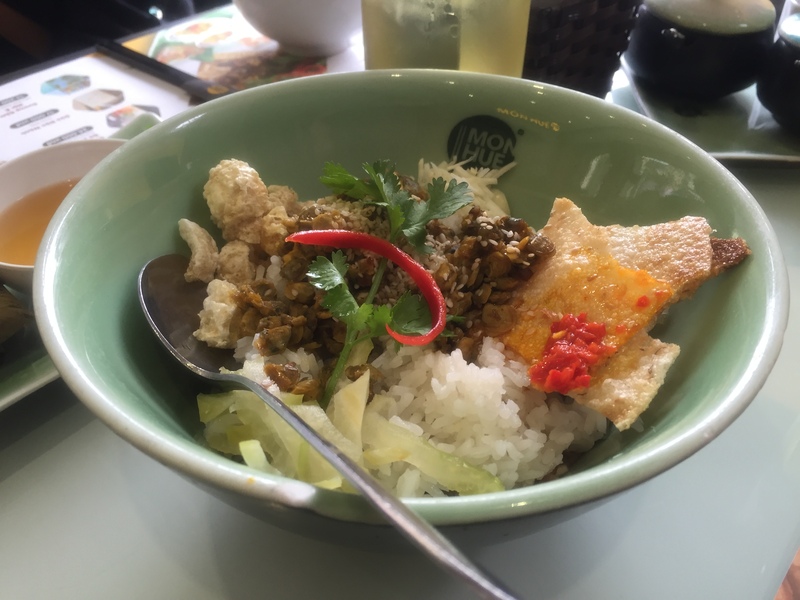 I mention this because though Món Huế is a sit down place, you might want to give it a try as they serve exclusively Huế cuisine, which is in its own international worthy cuisine world. And I’m certain our friends didn’t take us to a place straight from the airport that didn’t meet awesome expectations. Our friends Pham Trường Sơn and Trần Thu Thủy at Món Huế. Huế appetizer treats start the meal. Cơm hến (before adding clam broth and blood red chili sauce), Anthony Bourdain’s favorite soup in the world. 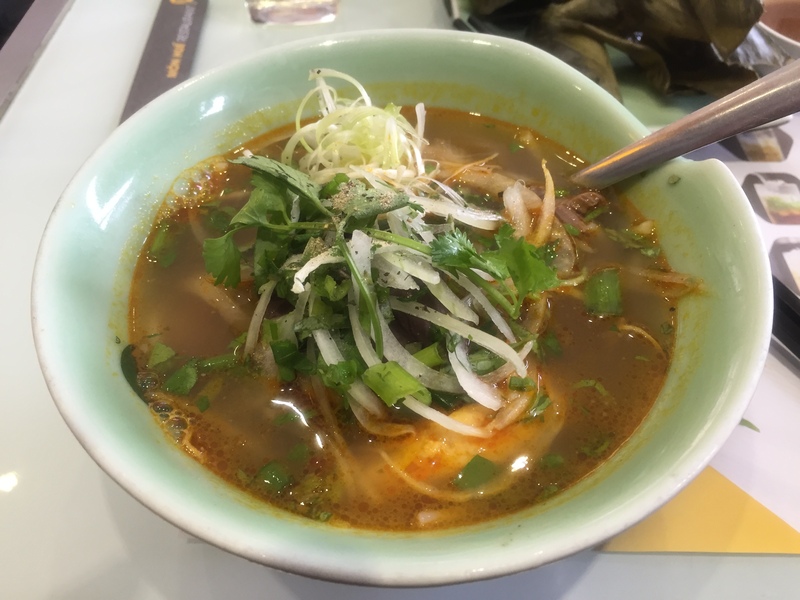 Delicious finale to the meal is a Huế style soup. 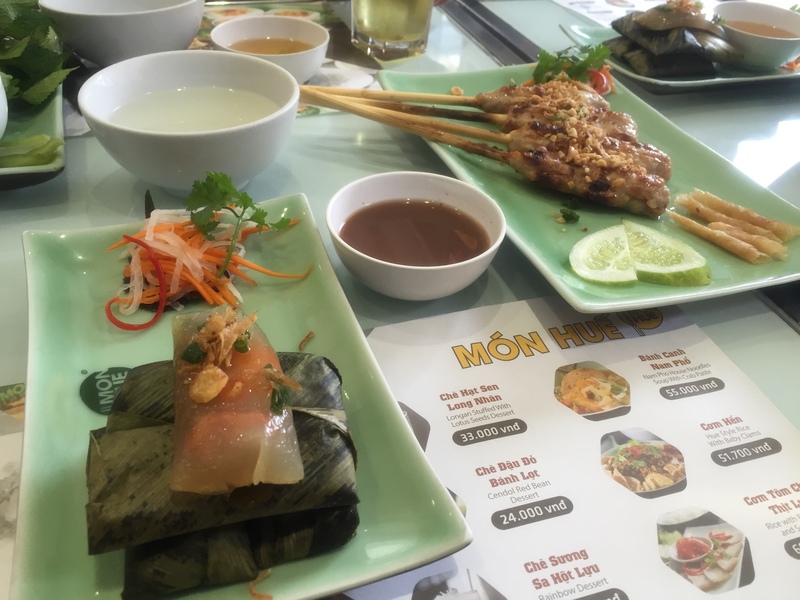 Telling you about Món Huế was not a detour, just our first lunch. But it is time to get into the cacophonous streets. Because food in Hà Nội gives curbside service a new definition. 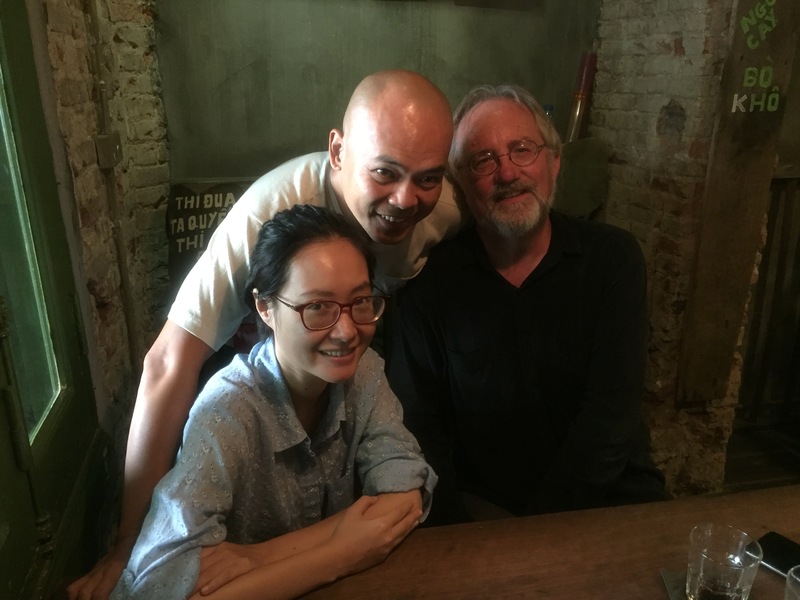 For our second lunch we reunited with composers Vũ Nhật Tân and Tràn Kim Ngọc and met the new manager of the Hà Nội New Music Ensemble, Bông Hoa, who we’ll be mentoring the next few months to help build a solid organization capable of international standards. It’s a long road but the enthusiasm is high! 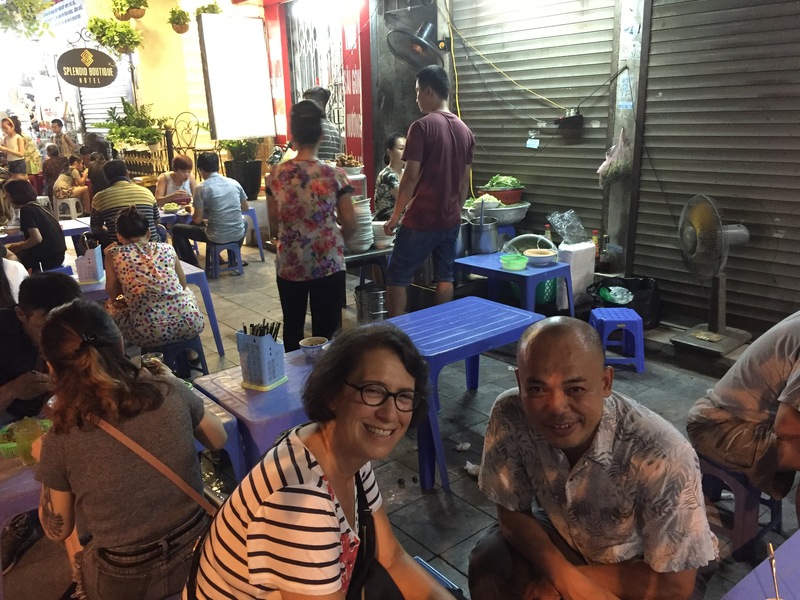 With lifetimes of street food experience behind them, our friends urge me to share with you their two favorite places for phở bò (beef noodle soup) in Hà Nội. True, this famous meal is a powerful remnant of the French colonial era, as the numerous Parisian colons needed to have something related to a rich hearty soup. Phở bò was the result. In the 21st century we recognize the soup as iconically Vietnamese. So here you go foodies. Hà Nội Old Quarter street food phở bò secrets revealed! You want to try Phở Sướng, found in a little alley at 24B Ngõ Trung Yến in the Old Quarter, or Chuyên Phở Bò át 50C Hàng Vải. We settled on Chuyên Phở Bò. There are a few more recommendations coming but be aware, sidewalk places close when they are sold out, which happened to us walking around. Stay connected to future posts! Curbside haute cuisine at Chuyện Phở Bò át 50C Hàng Vải. It’s at the end of the street in the Old Quarter. 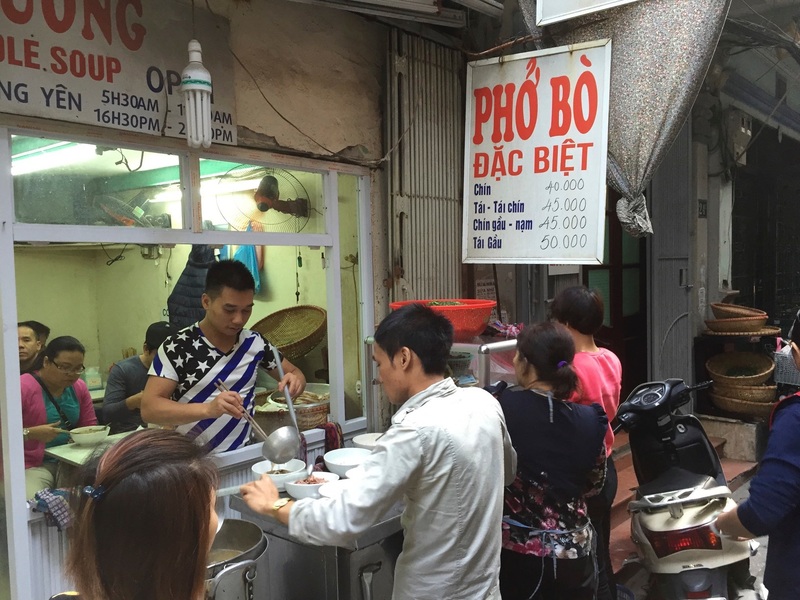 Phở sướng is another favorite of my Hanoi friends and is found in a small alley at 24B Ngõ Trunh Yên in the Old Quarter. Another benefit of coming to Hà Nội this September is that our visit coincides with the Autumn Moon Festival, the Thanksgiving to Vietnam’s Christmas, the Tết Lunar New Year. 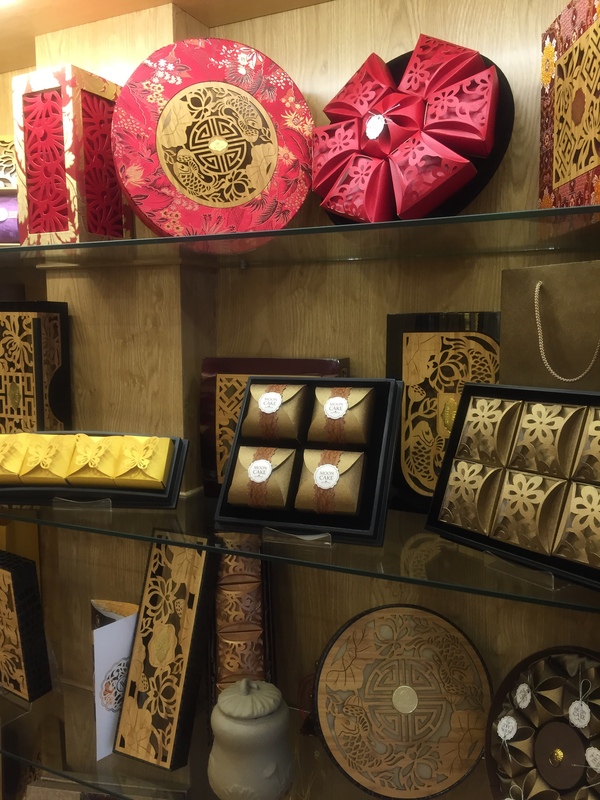 The city is in full bloom with moon cake shops galore, a sight Jan and I will always treasure in our experiences. Moon cake shops abound in Hà Nội for the Autumn Moon. The Autumn Moon Festival takes three days, as the first night welcomes the moon, the second admires the moon and on the third we chase the moon (if you’re an American, think back to the old song “Shine on, shine on harvest moon….”). The density of pedestrian and motorbike traffic in Hà Nội makes Times Square on New Year’s Eve appear like an empty parking lot. The ferocious dragon drums bang evil spirits away and I’d swear my mom can hear them in heaven. That’s the point. Because the Vietnamese exist in a symbolic world, even if they don’t seem to acknowledge its presence. Here’s an example that illustrates my point. Jan and I arrived on September 8, 8 being a lucky number. But the luckiest Vietnamese number is the number 9. So when best friend Vũ Nhật Tân arranged to meet us, we had an inkling that along with our first reunion cup of Cộng Cà Phê coffee, he would take advantage of an auspicious opportunity. One we’d set up when we arranged our flight schedule. He didn’t let us down. We met on 9/9 at 9 AM to renew our decade long friendship. You tell me if this trip is going to be successful! Jan and Vũ Nhật Tân at Bún Cá Bánh Đa in the Old Quarter during the Autumn Moon Festival. 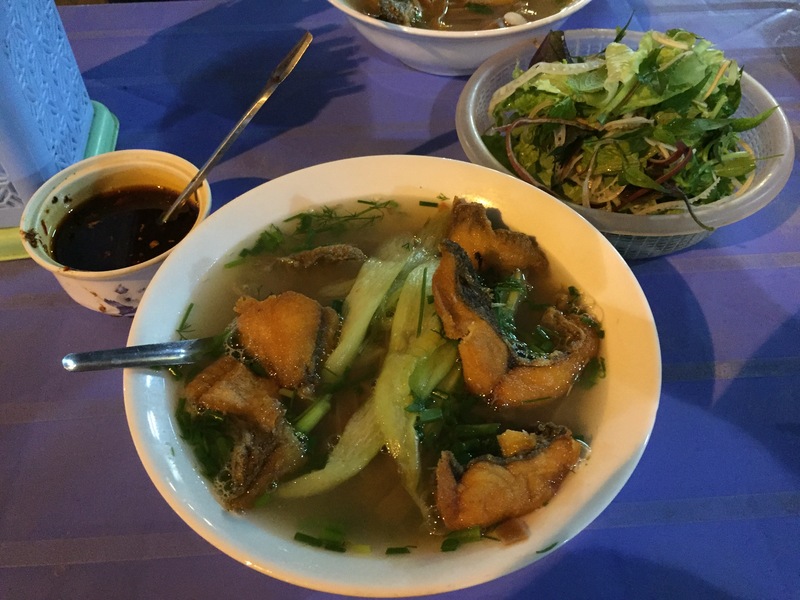 Back to street food tips for your next visit to Hà Nội! Vũ Nhật Tân suggested we go for dinner during the Autumn Moon festivities for a one of a one street food experience. Sorry, but CNNs Anthony Bourdain doesn’t know about Tân’s places (at least I’ve not seen him talk about Hà Nội’s cinnamon infused pork pâté beloved by Tân’s father), so if you’re reading my posts consider yourself lucky. 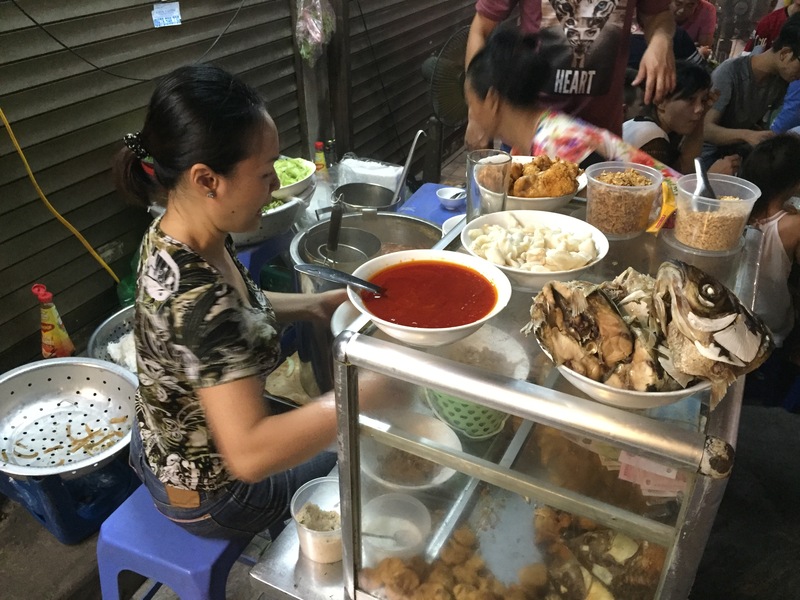 There is ONE place in the Old Quarter that serves red rice noodles with fish. ONE place. 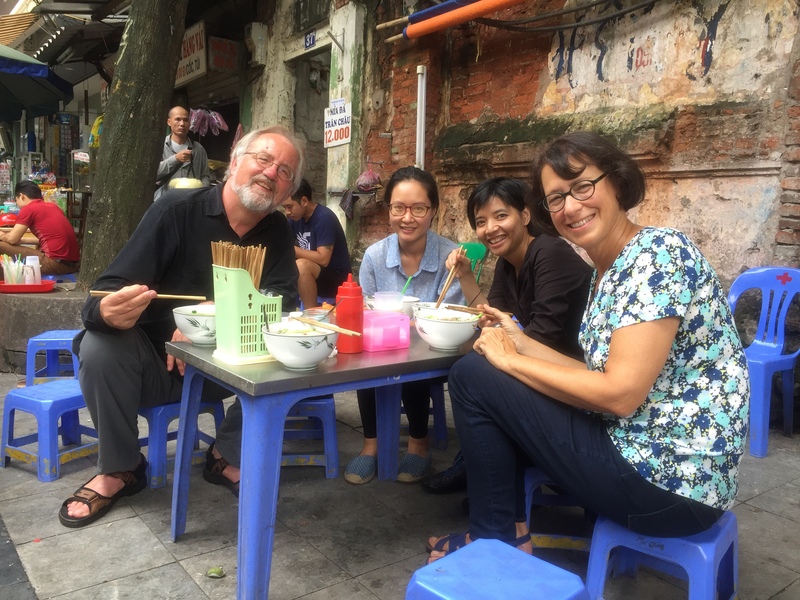 Though getting turned around in the maze of streets of Hà Nội’s Old Quarter is often charming, should you want to find this unique noodle protectorate let me give you a landmark. 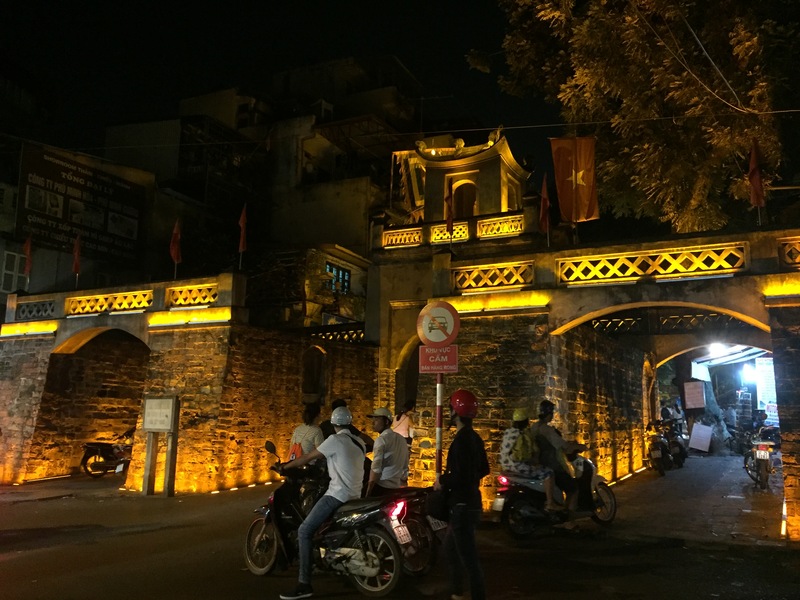 You need to find the Old Gate of Hà Nội, the last survivor of a tumultous past. Think of it as the Vietnamese version of Jerusalem’s Wailing Wall. Still standing, the Old City Gate will help you find Bún Cá Bánh Đa. Once you find the gate, walk down the street just a short way on Hàng Chiếu to Number 15. Without the sign I’m posting, finding Hàng Chiếu 15 might define frustration. I wouldn’t look for tablecloths, either, just tiny little blue stools. 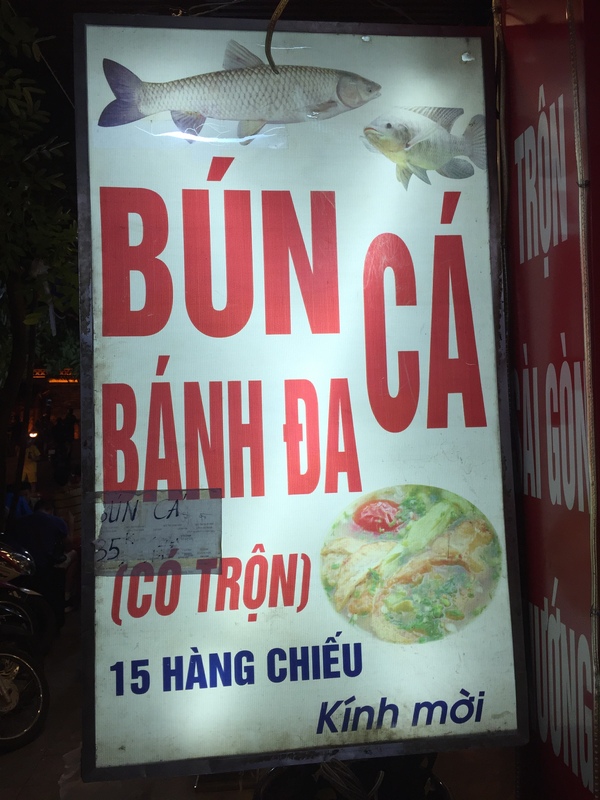 Find the sign for the Bún Cá Bánh Đa. The Last Place Standing still making red rice noodles with fish soup. Enjoy the following photo gallery! This is the sign you need to locate. Bún Cá Bánh Đa, a treasure bowl of soup. Be sure to use the fiery chilli paste to the left and wilt fresh vegetables in the broth. The red rice noodles are drowning underneath the fish and vegetables. Ask for more broth if needed. Who needs a celebrity chef? This is haute cuisine in Hà Nội, as her red rice noodle fish soup is what she makes. End of story! One more detail. Notice the green rimmed jar with briny garlic. It’s an essential addition, but add to taste and don’t over do ít. It’s one thing to eat out. But knowing how to cook is not just an option for me, it’s essential to get beyond the noise of foodie TV, which for my taste can’t seem to include a decent vegetable sequence. I understand that quivering textures of roasting meat photograph better than a sliced cucumber, but there’s more to life than pictures (so says a musician). If you’re following my posts you know I grew up in a professional kitchen, working for my parents. Though my life is dedicated to music, cooking is in my DNA. Even when I wash the dishes I can still hear my mother’s voice telling me how to organize them and that she’d better never run out of clean silverware! Jan and I have been studying Vietnamese as much as we can before returning to Hà Nội, which accounts for the endless diacritical marks now appearing in my posts. Those marks bookend the Vietnamese obsession with specific sauces for each dish, which borders on a French-like insanity for culinary perfection. Let’s just say if you ever need a challenge, try learning this language, or its cuisine, and then try to master its pronunciation, or tastes. As professional musicians Jan and I still need a lot of teaching. As home cooks there is much to learn. But we have the best tutor in Trần Thu Thúy, who you met at the beginning of my post as she met us at the airport. 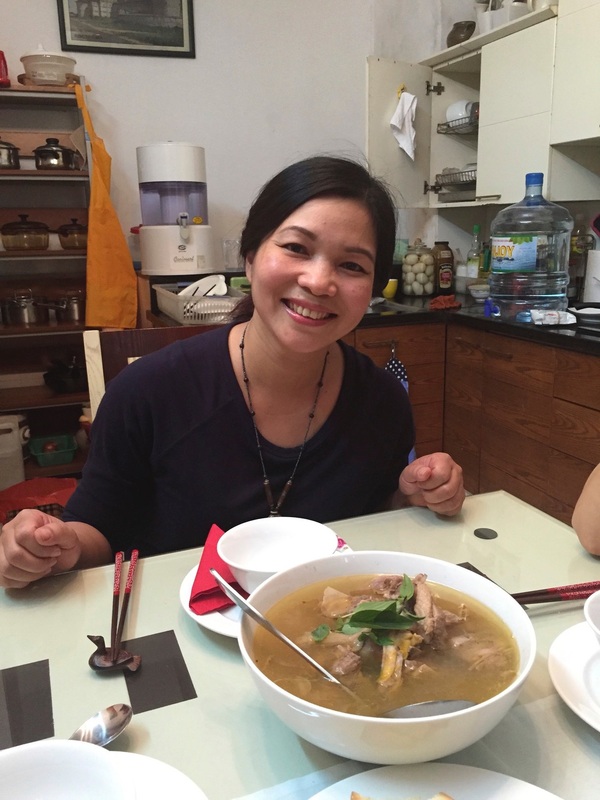 Trần Thu Thuỷ in her kitchen with her off the charts duck soup. We’ve felt like elementary school kids getting a good report card as Thủy and our friends are impressed with our progress. I’ve never been prouder in my life asking for a cup of coffee, buying vegetables, or calling out rehearsal numbers. Being successfully understood in Vietnamese, usually with thumbs up encouragement, has its own rewards. Trying to speak a foreign language allows you to build trust within a different culture. Fluency? It does still seem like Vietnamese is the language equivalent of climbing Mt. Everest. 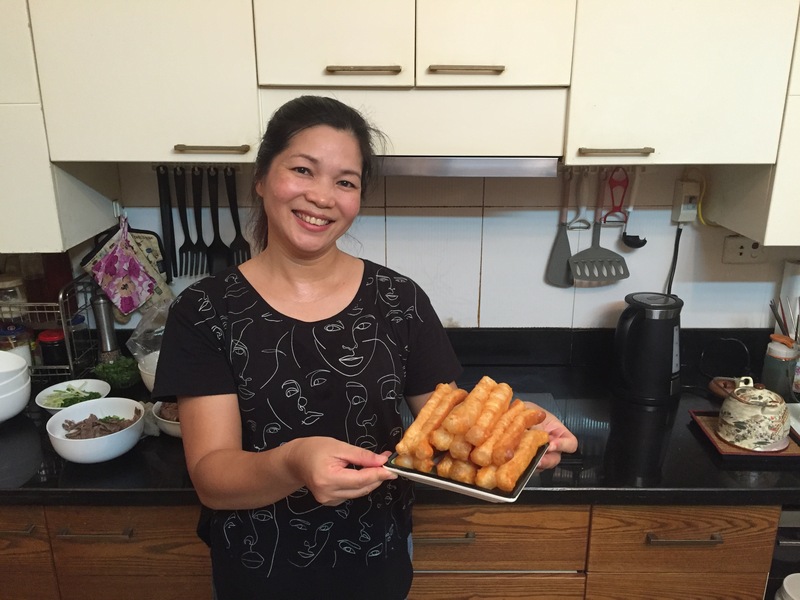 Our encouraging tutor Trần Thu Thủy is also an awesome cook. Learning from her kitchen about Vietnamese food, getting recipes and understanding the essential herbs and spices that produce her country’s authentic tastes, is a life lesson infused with love and affection. 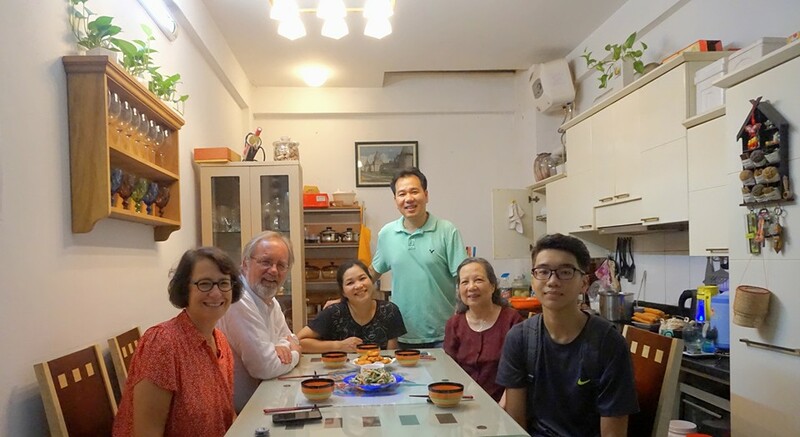 So when she decided on the spur of the moment that we had to come to dinner, her husband violinist Pham Trường Sơn whisked us to their home. A simple weeknight meal with awesome results. Dinner at home in Hà Nội with Pham Trường Sỏn, Trần Thu Thuỷ and their family. 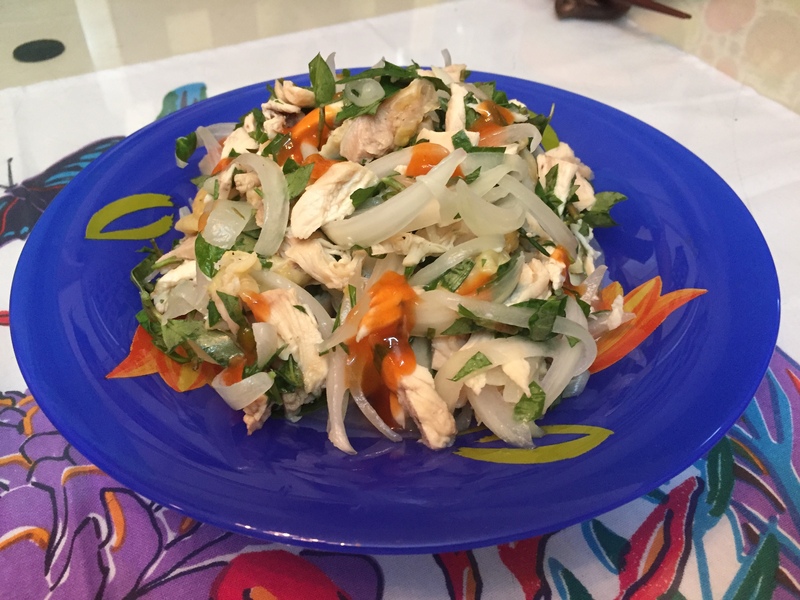 A refreshing chicken and onion salad with rau răm (laksa leaves). Mực chiên (fried squid) with a fiery hot sauce as an appetizer. 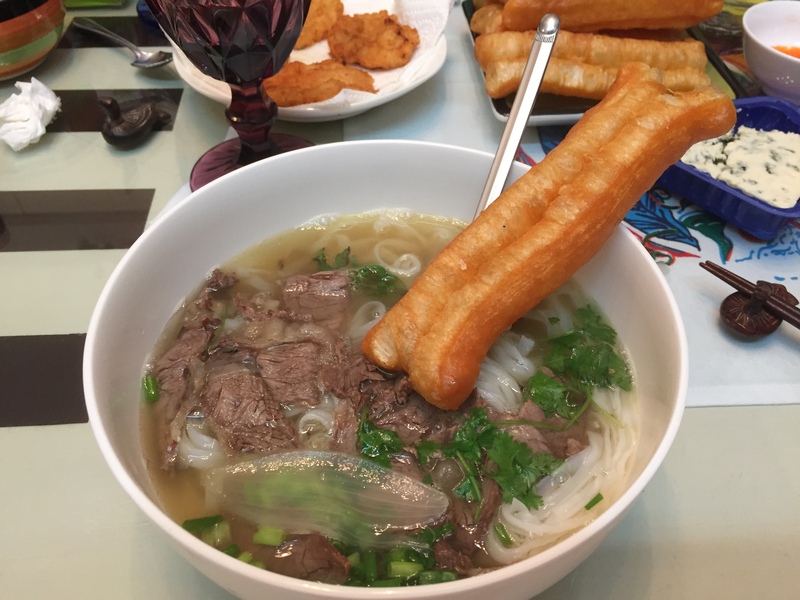 This could be the best phở bò in all of Hà Nội! 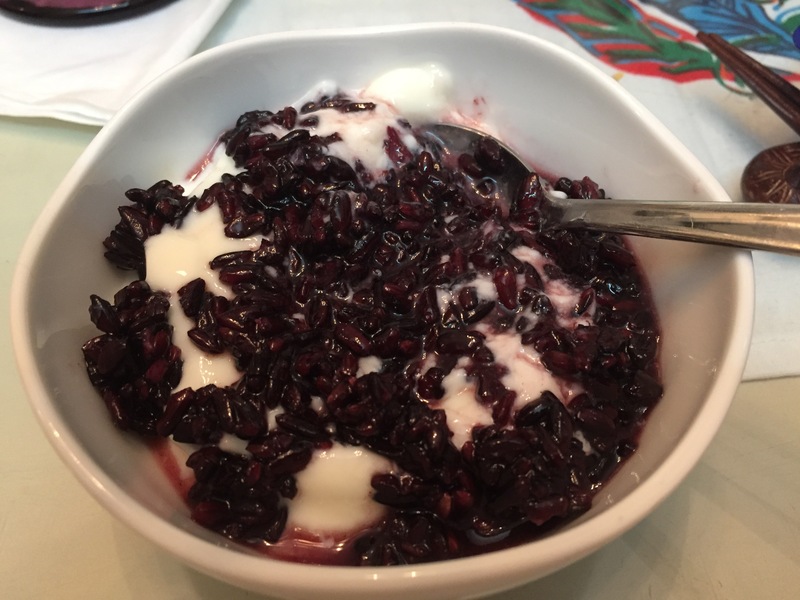 Đậu đỏ (red beans) with yoghurt was a fantastic dessert. 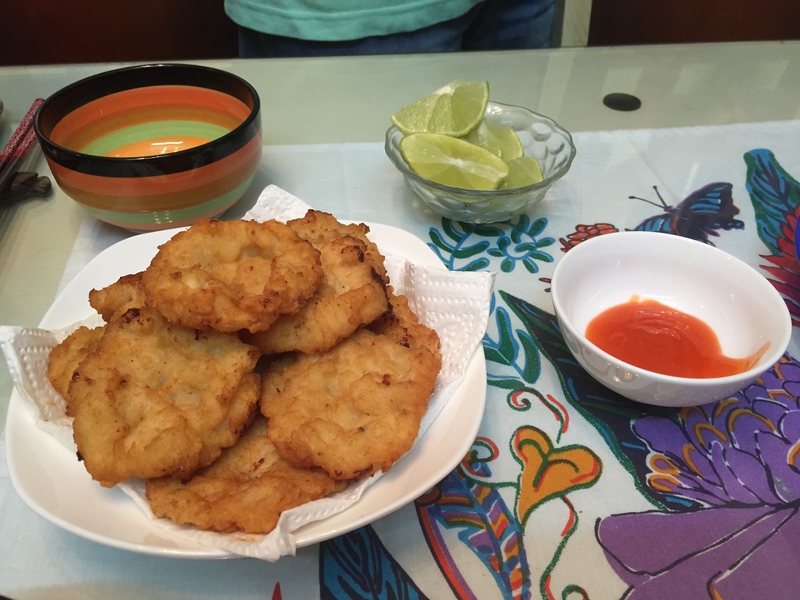 I’ll return with more blog posts that I hope you enjoy, and I’ll include some recipes as well, plus the ingredients you need to make the real thing. But nothing replicates the curbside appeal of eating on the street here, or the love of a home cooked meal. So find a piggy bank and keep dreaming if you’ve never been to Việt Nam! Our wonderful Vietnamese tutor, significant home chef and dear friend Trần Thu Thủy in her kitchen. See you soon as our autumn with the Hà Nội New Music Ensemble continues. And just remember – musicians know the best places to eat in any city in the world. Keep checking back for more secrets of Hà Nội’s addictive cuisine.